When I was a kid, we spent a good deal of our summer outside, coming home only to eat and sleep. Our BMX bikes were our ticket to freedom, allowing us to get all around town and out into the hills for some play and adventure. These days though, not as many kids are doing this. Many of our childhood play places have been developed. Traffic isn’t as safe. The houses have air conditioning. Video games, Internet, iPods, and other electronics keep our kids (and to be fair, many adults too…) enthralled and entertained. Too many excuses. Too many distractions. I want to make sure I instill the love of the outdoors in my son, the same way it was done to me when I was young. And although I’ve tried hard to make this happen, I still see all that other stuff taking hold of his attention. 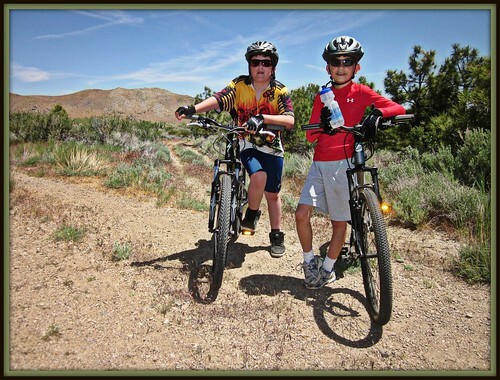 With my son’s recently acquired full-sized 26″ wheeled mountain bike though, the outdoors now have more than a fighting chance to keep him interested. The bird was way too proud of its catch to take flight and leave it behind, and it allowed us to creep in for a really close look. Definitely not a hawk, and definitely not a mouse. It was a Golden Eagle, and it had a rabbit the size of a cat in its talons! Fur that was stuck to its beak blew in the light breeze, and its steady raptor eyes warned us that it would fight for its lunch. 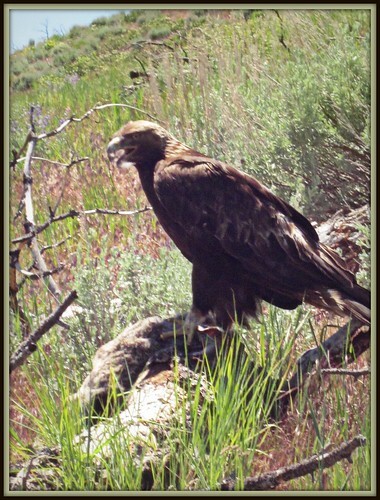 We crept up within 12 feet of the eagle to snap a photo, then retreated to let it do its thing. This turned out to be an exciting distraction from the workout of the climb, and then it was time for some downhill! We reached the turnoff to a nice long singletrack that follows the rim down along Vicee Canyon. We descended down smooth, fast, swooping trail, and marveled at the creek far down below us in the canyon. Perhaps not unlike what the eagle experiences during its hunt. We had one wipe-out in a sandy corner that got some laughs, and at the bottom, there was much excited talk and instant replay of the descent. We had just had a lot of fun outside. An adventure even. Take THAT, Nintendo. Great photos of the Rabbit Lunch!